Lower trading volume in the holiday season could be a reason for the big moves in the market. The earnings season beginning Jan. 14 will provide concrete direction for the market. This week's wild swings on Wall Street mean little to some market players, who look past the huge bounce in stocks and are ready to zero in on the earnings season that kicks off in the second week of January. 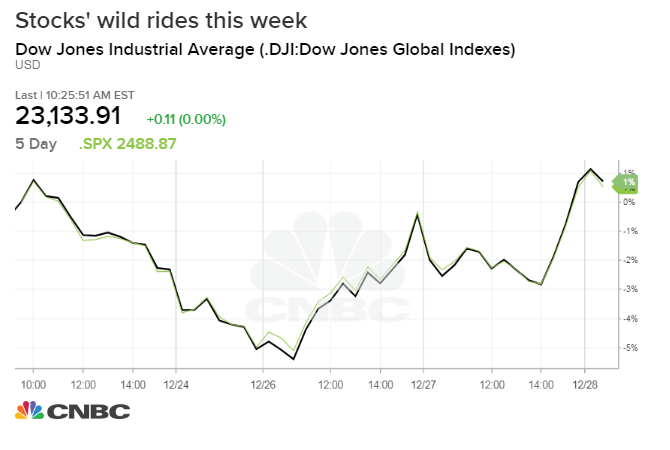 The Dow Jones Industrial Average on Wednesday surged a whopping 5 percent, the largest one-day point gain in history. The next day, the 30-stock index pulled off an 870-point reversal in another wild session to close up 260 points. Yet the moves might have little implications as to where the market is headed in the new year due to the lack of activity during the quiet holiday week. "You don't want to make too much out of one or two days of market action. You really need to see what the overall fundamental picture looks like. The proof is going to be in the pudding when earnings season kicks off in the second week of January, when everybody is back and when companies start to give 2019 numbers," said Steven DeSanctis, a Jefferies equity strategist. Lower trading volume in the holiday season could be a reason for the big moves in the market as small orders make bigger impact. While it's hard to put a concrete finger on the market driver, the ultimate scorecard will come down to companies' 2019 guidance, which is poised to give the market some direction. Earnings season begins Jan. 14, when the big Wall Street banks start reporting. "It's difficult to make any real concrete assumptions both down and up. There's not a lot of news coming around with regards to the markets. For us, we are really going to pay attention to what 2019 outlooks mean for consensus estimates," said Jeremy Bryan, portfolio manager at Gradient Investments. Wall Street analysts are already slashing their earnings estimates for 2019 to just single-digit growth, a big slowdown from the record 21 percent earnings growth expected when 2018 is all said and done, according to FactSet. "Expectations have come down pretty dramatically at this point. With that, you have got a pretty low bar to hop over. The guidance companies give is going to be around what the tariffs are going to be and what the impact of Washington is going to be," DeSanctis said. The market may already be pricing in the lower expectations as evidenced by a severe drop in valuation. The forward price-earnings ratio for the S&P 500 fell to 14.62 on Friday, the lowest level since October 2014. "I don't think 2019 outlooks are going to charge the market straight up. I don't think they are going to be significant above where the sell side is right now. Valuations have taken a pretty significant hit recently, so is that already priced in — that's what will be the big determinant," Bryan added.